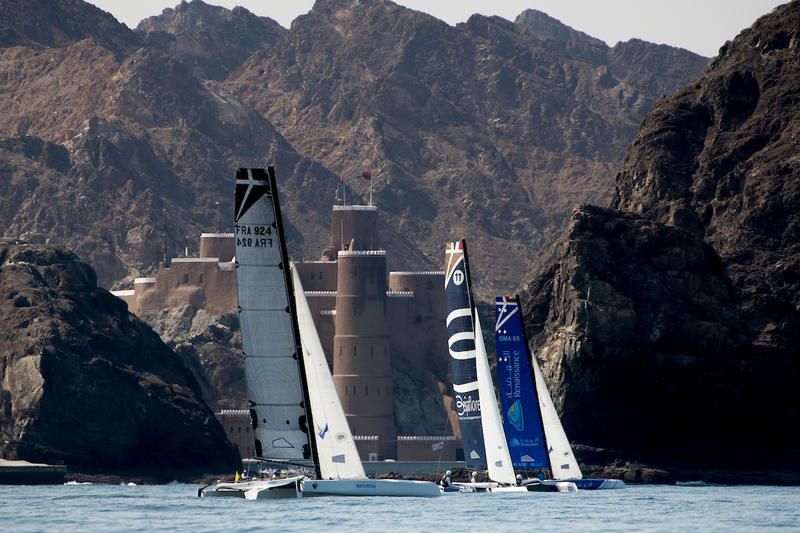 Muscat, February 4 2019: Only seconds separated the leading yachts on the first coastal raid of EFG Sailing Arabia – The Tour as the international fleet took to the waters off Muscat, Muttrah and Bandar Al Khiran on Monday. 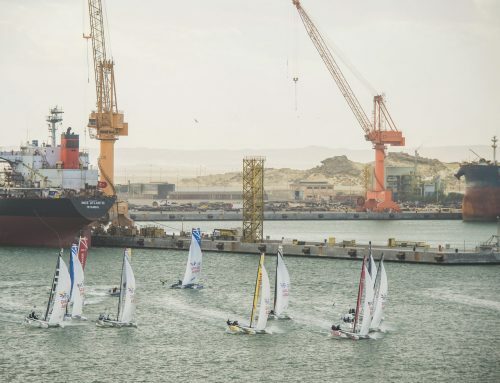 After almost two hours and 36 minutes of racing the French team of Cheminée Poujoulat took the win just 15 seconds ahead of the Oman Shipping Company entry, with EFG Bank taking the third spot on the podium. 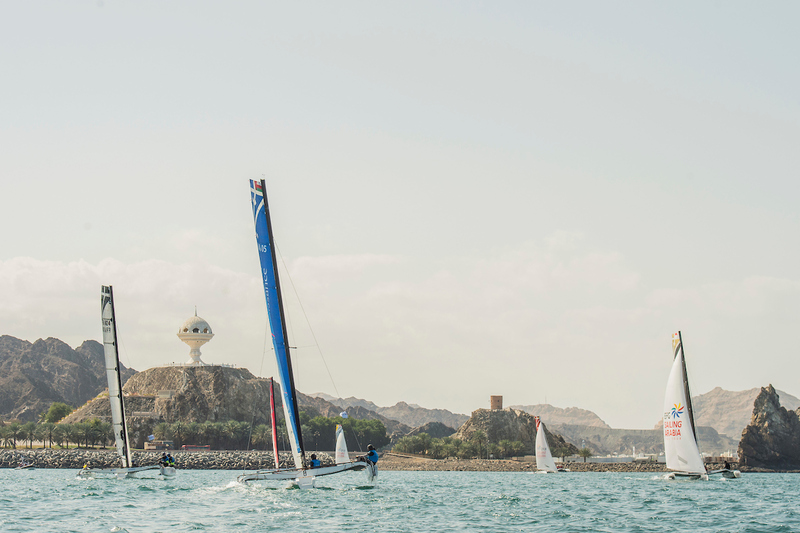 Their impressive result in the opening coastal race of the two-week Oman challenge – along with second place in the flurry of stadium races on Sunday – moved Cheminée Poujoulat to the top of the overall EFG Sailing Arabia – The Tour table, with the Oman team in second spot. Skipper Robin Follin said: “On the raid we did not play any bad shots and at the finish we were in a one-on-one with Stevie Morrison on Oman Shipping. 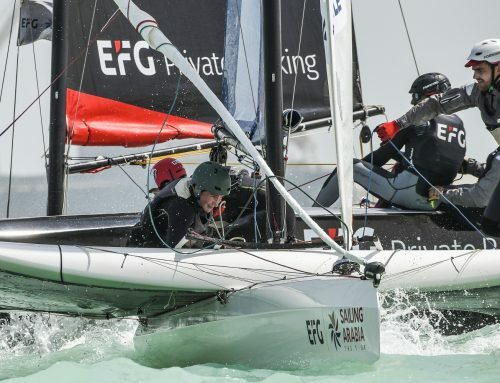 In contrast to the strong winds and high-speed racing of Sunday, the 23 nautical mile coastal course started in a light and unstable breeze, the 10 teams working hard to get every bit of boatspeed out of their lightweight Diam 24 trimarans. 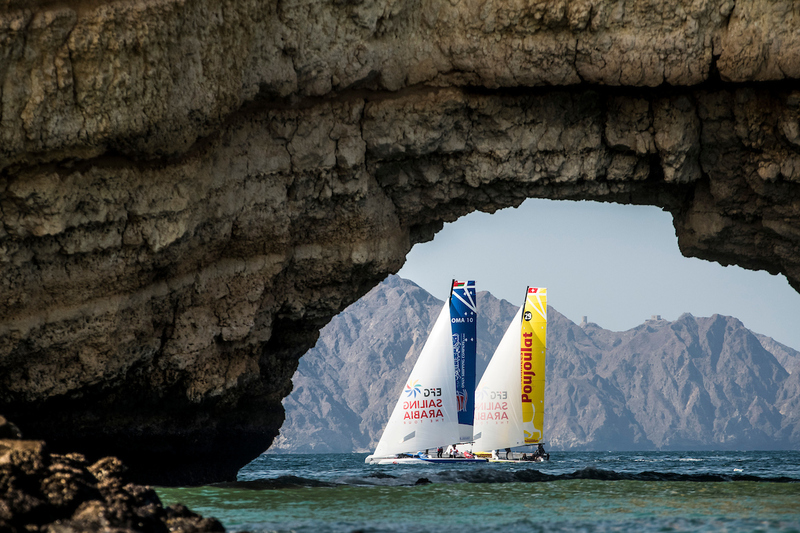 The opening legs favoured those who hugged the rocky coast on the way to Muttrah, with Oman Shipping Company and Cheminée Poujoulat hitting the front of the fleet after early leaders CER lost out after venturing too far offshore. Oman Shipping Company’s international crew of British skipper and helm Stevie Morrison, experienced Oman Sail instructor Raad Al Hadi and French tactician Quentin Ponroy held a narrow lead until almost the last mark of the course before being passed by their French rivals as the wind increased. 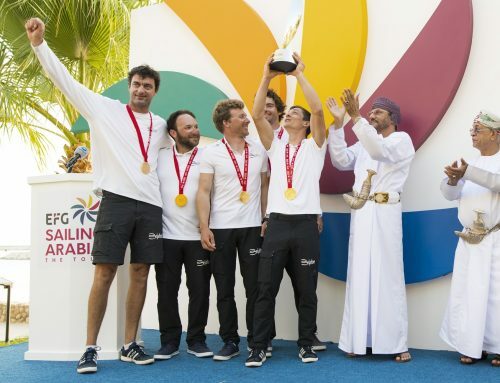 Speaking as he and his team dismantled the boat for the road trip on Tuesday to Sailing Arabia’s next racing venue in Sur, he added: “We are a new team and we are still evolving the way we work on the boat. But we are very happy to have finished second, which is better than we could have hoped for in this fleet. We have got some lessons to learn and we will get better, but I am sure all the other teams will as well. 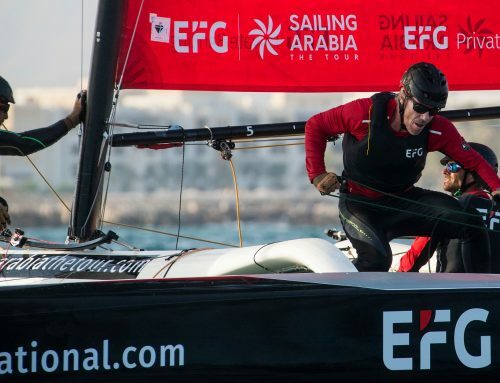 The coastal race also marked a return to expected form for pre-Sailing Arabia favourites EFG Bank, skippered by French star Franck Cammas with Oman Sail regular Thierry Douillard and Omani dinghy ace Hussein Al Jabri, who had finished the first day second from bottom of the table. “It’s better than yesterday!” said Cammas. “The first two got away at the start of the race and we were in the middle between two groups. 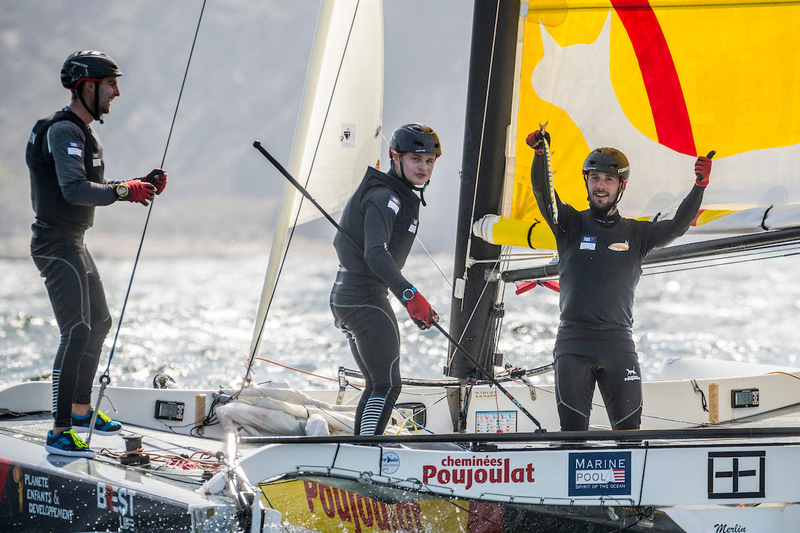 In another reversal of fortune, first day leaders Golfe du Morbihan finished the coastal raid down in eighth place, a result that drops the young French team to fourth overall behind Cheminée Poujoulat, Oman Shipping Company and the Swiss team on Mood. 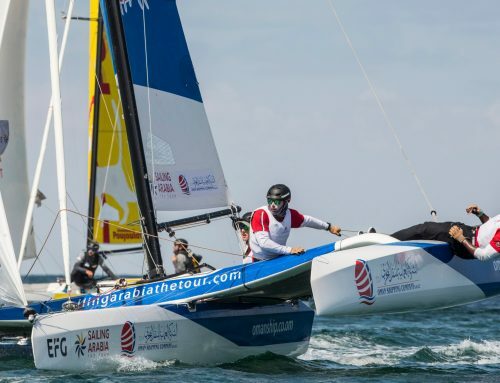 Racing in EFG Sailing Arabia – The Tour is scheduled to resume in Sur with a second coastal raid on Wednesday 6 February, followed by stadium racing the following day, before the fleet moves again to Masirah Island.